I have long felt haunted by the fate of Chile. I can’t help but feel a strong attachment because the people who were involved, and “disappeared,” tortured and killed, were me and many of my friends and fellow activists. Not literally, for I was a boy in 1973 and lived on another continent. But if I were then, and there, who I am now, I would have shared the fate of Chileans who believed a better world was possible. I continue to be struck by the fact that participants in the government of Salvador Allende freely apologize for their mistakes. It is no revelation to say President Allende’s Popular Unity government was not perfect. It was full of people who previously had been shut out of political participation — is it reasonable to expect perfection from them? But contrast their thoughtful reflection with the behavior of the coup plotters and those who took up posts in Augusto Pinochet’s murderous 16-year reign. It is to the credit of those who reflect on what they could have done better, who are moved to publicly acknowledge mistakes, particularly in actions or speeches that, intentionally or not, served to throw up barriers to participation by those in mild opposition or sitting on the fence. Their humanity is there for us to see. Where is the humanity of those who killed, those who tortured, those who willingly served a régime that inflicted casualties in massive numbers and hurled millions more into poverty? The Pinochet coup was the first application of “shock therapy.” The intellectual author of this shock, Milton Friedman, repeatedly used the word “shock” in advising General Pinochet to apply a maximum of pressure, helpfully reprinting a letter he sent to the dictator in his book, Two Lucky People: Memoirs. The authorities had concocted false charges against the couple; the torture was intended to force a false confession. so that the future may flower. Equality or dominance. The ability of everybody to develop their full potential and be full participants in societal decision-making or a minuscule elite hoarding wealth and dictating to everyone else. This entry was posted in Culture, Latin America and tagged Chile, literature, neoliberalism, poetry, Salvador Allende, shock therapy. It seems like Friedman’s chickens are coming home to roost in the land that gave birth to disaster capitalism. As America struggles under the weight of the sequester (austerity), even the serfs are starting to speak up and speak out a little by voicing their opposition to war in Syria. I think this resistance was not born out of a newfound love for the Syrian people but resentment that there is money for bombs but not butter. Eventually, this will have to be dealt with by increasing measures of force lest the people start falling out of love with their captors. Official propaganda loses its potency when it becomes, too frequently, too divorced from reality. Increasing measures of force is the standard response when people stop believing — folks in the Occupy movement received a dose of it, courtesy of the Department of Homeland Security. All the more reason we have to be better organized. Certainly better organized than Occupy, although I do not at all discount the example of horizontalism and egalitarian decision-making it provided. But, if a movement is to be effective at creating change rather than simply doing the (vital and necessary) work of opposing what is wrong, it has to be able to lead and organize. September 17 is the second anniversary of Occupy Wall Street, and, whatever our critiques of it may be, it is important that we all take part in at least some of whatever may be going on in our locale. I will be. Don’t mourn, organize! Two observations: First, the entire history of capitalism is one of violent imposition of its imperatives. For those who say that capitalism merely reflects human nature, why does it always have to be imposed by force? Second, Jeff is quite right in that the opposition to a new war in Syria has everything to do with the lack of money for “butter” and nothing to do with understanding the forces that generate these wars. There is no wide-spread recognition that Obama, like Putin and Assad (and hundreds of other enforcers of the capitalist order), is a profoundly evil man. A man who sits in the basement of the White House every Tuesday and decides who will be murdered by drones is a profoundly evil man. I’m reading a most interesting book by Joel Kovel, The Enemy of Nature: the end of capitalism or the end of the world?. The central point of the book, as I see it, is to get the reader to understand that “everything in capitalist society is conditioned by capital, from the EPA to the raising of children, and the writing of this book” (p. 165). The topic is crucially important, but I think Kovel veers off the mark often (his understanding of the rise of capitalism is in error, I think, in chapter 7), but chapter 8, A Critique of Actually Existing Ecopolitics is a devastating critique of volunteerism (fluorescent bulbs and recycling), technology (electric cars and the Internet), Al Gore (he “never ceased carrying water for global capital”), Green Economics (he analyzes how the Kyoto process is tied to capitalist accumulation), David Korten (his arguments contain no “concentrated critique of capital itself”), cooperatives (“a significant portion of the capitalist economy, from farmer cooperatives, to credit unions, and even some HMOs, is already in cooperative hands”) and more. “The great error of assuming that cooperatives – or community economics, or green capitalism, or any of the reforms themselves – will stem the crisis arises from confusion about their relation to capital. Capital will tolerate any number of improvements and rationalizations so long as its basic expansion is secured – and, indeed, many of the reforms succeed in doing just that, and are encouraged by the state or progressive elements of the bourgeoisie on that account, even if reactionary elements of the class may resist. Thus some cooperatives and green capitalism are allowed or even encouraged to join the club so long as they add modestly to accumulation, or at least keep out of its way.” – p. 180. Kovel calls for the abolition of capitalism. I haven’t read far enough to learn about his method for doing so, but I hope I’m not disappointed when I do read it. For all of its faults, it is a worthy book to add to your already long reading list, in my opinion. I still prefer the term ruling class because that’s what they do best…rule things. My best guess is capitalism is the facade that will be maintained until the true world order can be established, a golden age of neofeudalism where we all get to work on the global plantation. In America, indentured servitude has been normalized through the consumer debt industry, i.e., credit cards, student loans, medical/housing debts. Jeff, I just finished reading Kovel’s book and I thought it was a very valuable read. What he does, very effectively, I think, is to undermine the idea that there is such a thing as a “ruling class”. Certainly, there are powerful capitalists who have aligned with state power to violently enforce capitalist accumulation, but there is no “ruling class” to be overthrown, per se. He goes to great lengths to show how capitalism permeates our very existence and how we are all complicit in our own oppression. The enemy lies within all of us. The popularity of invoking the concept of a “ruling class” undermines our own power and contributes to our defeatism. Kovel’s contribution to the debate, I think, is that he marries socialism and the phenomenology of David Abram and Morris Berman, as he presents it in The Reenchantment of the World. Kovel does not present a pathway to the paradise of ecosocialism, but he does say that global warming may lead to it. Of course, he also acknowledges that it could lead to a fascist state or a right-wing populist political movement with greatly distressing consequences. I think I have, at some time in the past, visited the website of the journal Capitalism Nature Socialism, but now that I know that this was Kovel’s project (he recently stepped down as editor), I will be visiting and browsing the articles to learn more. Articles that are 18 months old or older and back to 2005 can be downloaded for free. You could do worse than to browse back issues of Capitalism Nature Socialism, I think. Alcuin, I freely admit my understanding of economics is one of my weaknesses which is why I prefaced my statement with “my best guess”. When I use the term ruling class it’s not to invoke defeatism but to elicit a concept that laymen (like myself) can wrap their heads around. I can envision a ruler, i.e., a king, queen, President, rich (white) man, much easier than a shadowy transnational capitalist. Regardless of terms, it seems the ends reached are similar…ruling the world. Thanks for the resource, I’ll have to check it out. Joel Kovel’s works earn a recommendation from me, also. I haven’t read Enemy of Nature, but I have read Red Hunting in the Promised Land and The Age of Desire, both of which explore the themes the two of you are discussing. I won’t quibble too much with use of the term “ruling class,” imprecise though it is, as the nature of capitalist society can’t be understood without grasping the concept of class. “Bourgeoisie” is better, but as it is unfamiliar to many people, I prefer to use either “industrialists and financiers” or “capitalists” as a substitute as they are descriptions of the actual people who sit at the apex of the pyramid and hold decisive influence over society. Alcuin and Joel Kovel, however, are correct in that there is no set group of people who can be overthrown. Because capital is restless under constant competitive pressures, the identities of those at the top, or manipulating the levels of power, will always be in flux. We thus come back to the system as the root problem. And Joel does valuable work in demonstrating the pervasiveness of capitalist ideology in all of us, which keeps the engine running. Convincing people that they like being oppressed, as long as a few goodies keep being dangled in front of them, is a far more stable way to maintain towering inequality than applying the boot. The boot, of course, is routinely applied, but as long as it is applied to the Other and not to moi, we can close our eyes to it, or justify it as just retribution to “terrorists.” Sooner or later, however, the fist is applied at home. Remember that Madeline Albright is far from the only U.S. official who has asked “What’s the point of having this military if we aren’t going to use it?” Slowly but steadily, the military is being used here. How far will this be allowed to go? I ordered Red Hunting in the Promised Land: Anti-Communism and the Making of America from Abe Books (I don’t do Amazon any longer) today. It looks like a very interesting book. In answer to your question about the military, my speculation is that it will be allowed to go a very long way. Capitalism has so atomized this society that we are going to be just like the classes of people that Martin Niemöller wrote about in his famous poem. Anyone opposed to capitalism will be deemed a “terrorist” and ruthlessly suppressed. The only way out will be, as Kovel speculates, through a renewed Left making a connection between global warming and capitalism. I’m not hopeful of that happening, though. I think a military dictatorship is more likely and a scenario that the bourgeoisie have already extensively planned for to protect their class privileges. I started out reading Kovel’s Red Hunting in the Promised Land, but was soon sorely disappointed. I got to page 35 before starting to skim it and then I just tossed it on the recycle pile. I’m glad that I only paid $1.00 for it. I’ve just finished reading Douglas Dowd’s magisterial Capitalism and its Economics and I’m spoiled now. Between Dowd and Kees van der Pijl, I have developed a keen eye (and dislike) for apologists of liberalism and capitalism. Kovel’s book is an incoherent (and incorrect, in at least one place, when he claims that Mayor Floyd Olsen supported the workers against the capitalists during the 1934 truckers strike in Minneapolis) and disjointed survey of a number of liberal and conservative apologists for capital in 20th century American politics. Those include Father Coughlin, J. Edgar Hoover, George Kennan, John Foster Dulles, Joe McCarthy, Hubert Humphrey, and Walter Reuther. Were they all anticommunist? Yes. But Kovel only lightly touches on why they were anticommunist. The words, “capitalist”, “ruling class”, and “elite” appear from time to time, but there is no analysis or theory tying his thoughts together. Red Hunting in the Promised Land is a book for liberal progressives who love FDR and don’t want to look any further for explanations on why they hate fascists and right-wing populists. On the subject of anti-fascists: were you aware that the HUAC went after anti-fascists, both during and after WWII? In other words, the United States, despite its’ leaders protestations to the contrary, supported fascism, because Franco and Mussolini protected American capital. Next up: Michael Mann’s Fascists. I can’t recommend Kovel’s book. I was aware of the long history of repression against anti-fascists. I was a friend of someone who fought with the Abraham Lincoln Brigade (no longer with us) and I’d tease him by calling him a “premature anti-fascist,” which he would chuckle at. The government went after them when they returned from Spain; in my friend’s case, if I remember correctly, he didn’t lose his job as a merchant marine because his union protected him. In those days, the CPUSA and SWP were very active in many unions. During the demonstrations against the Bush II/Cheney administration’s invasion of Iraq, several of the brigade members would come out. They’d always get big cheers from everybody as the march flowed past them. Speaking of Michael Mann’s Fascists, that is a book I was disappointed in. It received a glowing review in New Left Review, which is why I decided to read it. The same criticisms you made of Red Hunting, I’d make of Fascists. After reading it, I was puzzled as to why someone who contributes to NLR would have praised it so much. I agree with you, Systemic. I was attracted to Mann’s four network theory some years ago and bought Fascists and <The Sources of Social Power, Volume 1. I didn’t have time to read them until now and I’m unpersuaded in the use of his “theory” in Fascists. He’s all over the map, freely concedes that the data to support his “conclusions” is limited and does not provide an over-all theory of fascism. He also states that each country displayed a different variety of fascism. The only slight value I see to his book is that he points out that Italy, Spain, Austria and Romania had under-developed economies and authoritarian regimes that played a role in the rise of fascism in each country. He doesn’t bring up the fact that Germany was a new “nation” (1871) and had an authoritarian background (Prussia), either. Instead, he states that Germany was a liberal democracy. He plays fast and loose with the terms “socialist”, “capitalist”, “left”, “right” and seems to support the class-theorists, but then he doesn’t. I read the chapter on Italian fascism and was left unimpressed. I scanned the rest of the book and found myself getting increasingly annoyed by his quantitative approach (based on limited statistics) and his constant referral to his “forthcoming book”. I doubt that I’ll bother reading The Sources of Social Power, either. Both books are in the recycling pile. Given that William Domhoff’s theories are similar to Mann’s, I guess I’ll scan and toss them, too. The rise of capitalism, starting in the long 16th century, has rendered general theories of power irrelevant, in my opinion. I’m not interested in general theories of power; I’m interested in how capitalism is destroying the Earth. If an author can’t deal with capitalism in a coherent manner, then I don’t think s/he is worthwhile reading. Onward, comrades! Erich Fromm’s Escape From Freedom I found to be very interesting because he attempted to integrate social and psychological understandings with the material conditions that allow fascism to take root. Although some people close to me disagree with me here, in a way Fromm’s work is complementary to Leon Trotsky’s work on fascism, because, although Fromm roots himself in the psychological, he firmly plants the psychological in the material and political. Trotsky is rooted in the material and political while tying them to the psychological. In my opinion, Trotsky’s writings on fascism are as good as we have, even today. A contrast to Mann, whose work you have analyzed well. I read Fromm’s Escape From Freedom when I was a teen-ager, many years ago. I’m sure I would benefit from a re-reading of it. I read Polanyi’s thoughts on fascism last night and he makes sense. He essentially says that fascism was a response to the violent social changes in traditional societies caused by the expansion of capitalism. I wasn’t aware that Trotsky had written on the subject of fascism – I’ll have to check that out. 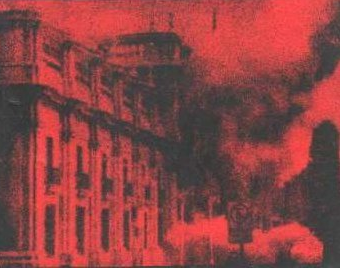 Thinking about the setbacks from the Paris Commune, the Spanish Civil War, up to the Pinochet coup in Chile, among others, or the memories of real people I knew who have fallen in the course of the struggle always make me sad. But these things also give you the courage to continue what they have started. El pueblo unido jamás será vencido! El pueblo armado jamás será aplastado! We only fail when we quit struggling. We honor the sacrifices of fallen brothers and sisters when we continue the struggle. Let us take courage from them at the same time that we draw lessons from their struggles. Are you familiar with securitization theory? I’m not. I ran across it when I entered “marxist cultural geography” in a search engine. One of the hits was a chapter in a book, The Dual State: Parapolitics, Carl Schmitt and the National Security Complex, edited by Eric Wilson. The title of the chapter is Capitalism, Covert Action and State-Terrorism: Toward a Political Economy of the Dual State. The author is Nafeez Mosaddeq Ahmed, someone I’ve never run across before. The book is horribly expensive ($87 is the cheapest I saw), so the only way to read it is at this link. What is the article about? It takes Schmitt to task, as well as the Copenhagen and Paris schools of security theory, for various failings and shows how the author’s position is better. Typical academic tactics. Since I’m not familiar with Schmitt, the Copenhagen, or the Parisian schools, I can’t vouch for the validity of the authors’ points. But I can say this: the article is one of the best pieces I’ve ever come across in that, if you apply your knowledge of world events and history while you read the article, you will have all of your “fuzzy edges” knocked off and your understanding of capitalism will reach a new level. Ahmed shows how there has always been a dual state – capitalism requires it. He also shows why the “shadow state” has been the object of so much effort on the part of the capitalist class to hide. Reading his article was like looking through a telescope with a highly polished lens – everything came into focus. His main points about the Copenhagen and Paris schools is that they don’t ground their theories in Marxism. Ahmed does and his theory shines because of it. The article was written before the Syrian chemical attacks, but it lends support to my theory that the attacks were coordinated and paid for by the CIA as a way to justify weakening Assad’s regime. I don’t think the rebels were involved – I think the CIA recruited some dissatisfied Syrian Army officers to do the dirty work. No doubt, those officers have fat Swiss bank accounts now and are living in exile, because Assad would eliminate them in a second, if he could find them. That’s not pulling any punches! I’ll be giving this one a read and perhaps will be the subject of a future blog post. As to the source of the Syrian chemical-weapons attack, your thesis appears to me to be consistent with a report I read recently in which German intelligence (eavesdropping on Syrian government communications) concludes that the weapons were used by the government side, but without the knowledge or permission of Assad, with German intelligence concluding that Assad has lost control over at least some of his military/security apparatus. If so, this could account for why Assad is suddenly willing to give up his chemical-weapons arsenal, knowing that it has become a liability to him. The above is speculation on my part as I do not know the facts, and I note the UN report on the attack did not make any conclusions as to who fired the weapons, only establishing definitively that they were used. And having read a report yesterday that two al-Qaeda-linked groups are gaining the upper hand in the ranks of the rebels, we must wonder what sort of fire the U.S. government is playing with. I thought the piece was so good that I spent hours and hours copying and pasting it into NeoOffice from the website – it isn’t easily downloadable (or at least it was a mystery to me how to sign up with academia.edu). I then spent more hours straightening out the footnotes and correcting a couple of them, because the the cited websites are no longer accessible. If you’d like a copy (I converted it to a pdf file), let me know. I’m researching Ahmed’s sources now – they look promising. As to the report you read that claimed that “two al-Qaeda-linked groups are gaining the upper hand”, think about this, which Ahmed brings up in his essay: the existence of al-Qaeda has benefited the capitalist class, because it provided a way to justify military bases in areas of the world which the U.S. previously had no presence in. The Guardian also carried a story hinting that Seymour Hersch’s new book will have something to say about bin Laden, although it did not provide any details. Indeed, al-Qaeda is a creation of the CIA and is has been a convenient excuse for all manners of military expansion and repression at home.